It’s rather incredible that the left-back to produce the best defensive performance against the Premier League’s joint-top scorer Mohamed Salah this season isn’t actually a left-back at all – rather, a converted winger who, at the age of 32, has unexpectedly made the role his own at Manchester United despite many expecting him to move onto pastures new last summer. That man is of course Ashley Young, who has proved something of a revelation on the left-hand side of Jose Mourinho’s defence this season, offering the maturity, solidity and shrewdness Luke Shaw seemingly can’t while using the technical qualities of his flying winger days to make an impact going forward as well. And the veteran’s performance on Saturday was just rewards for how impressive he’s been this season. Salah is one of the most feared wide forwards in Europe for his ability to either ghost into central scoring positions or jink his way past entire defences single-handed with the ball at feet. But Young didn’t allow Salah an inch as Manchester United recorded a huge 2-1 win over Liverpool in the Northwest derby; barring one suspect moment inside the box where he may have tugged the Egypt international’s shirt, Young kept Salah on the tightest of leashes, timely tucking in to close the channel between himself and Chris Smalling and refusing to let the Reds’ chief talent dribble through him. Accordingly, Young and Salah’s statistical returns from Saturday are incredibly telling. While the former made five tackles, four interceptions and five clearances, the latter failed to create a single chance, completed just one dribble and managed only one attempt at goal. 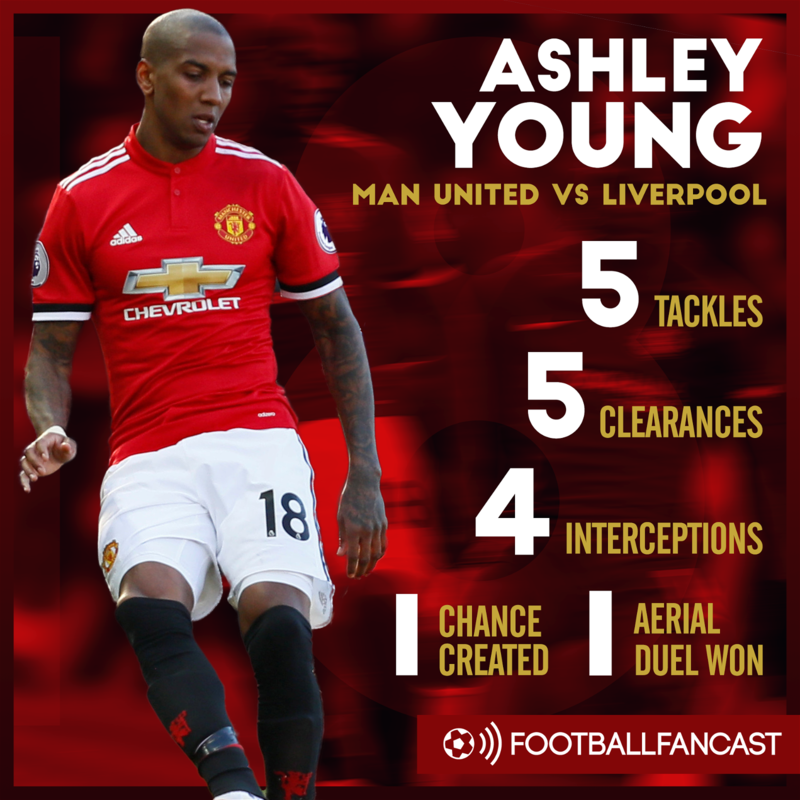 Indeed, Young – who Transfermarkt value at just £4.5million – completely nullified the consistently ruthless threat the 25-year-old has provided this season, which was an integral factor in Liverpool only managing to find the net through an Eric Bailly own goal. Upon a weekend in which Danny Rose was subbed off during only his sixth Premier League start of the season due to injury and Aaron Cresswell and Ryan Bertrand conceded six goals combined for West Ham and Southampton respectively, Young surely now enters the coming international break as England’s most convincing option at No.3.